The mineral assemblage and the sedimentological characteristics of the “Donauplatin” (Danubian fluvial placer containing platinum-group elements (PGE) and gold (Au)) are described for the first time in connection with upstream reference placer deposits near the potential source area in tributaries of the River Danube/Donau. Granulometric and morphometric data have been obtained using the CCD-based CAMSIZER technique. The platinum-group minerals (PGM; iridium, osmium, unknown iridium-osmium-sulfide, ruthenium-osmium-iridium alloys, platinum-iron alloys, iridium-bearing platinum, sperrylite) have been derived from ultramafic magmatic rocks, probably belonging to the ophiolitic series in the Tepla Barrandian unit of the Bohemian Massif. The Au-Pd-Cu compounds in the placer originated from dynamo-metamorphogenic processes in a sulfur-deficient environment at the SW edge of the Bavarian Basement. Gold in the “Donauplatin” has been reworked from a “secondary” or intermediate repository of lateritic gold (Boddington-type). Its primary source is supposed to be of orogenic origin. 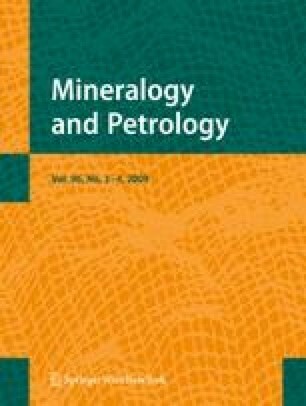 Provenance analyses of the associated non-heavy minerals point to high-pressure metamorphic rocks, igneous rocks (monazite) and high-temperature metamorphic rocks (750° to 850°C, zircon morphology). Garnet compositions indicate that meta(ultra)basic igneous rocks, calc-silicate rocks and skarns prevailed over paragneisses in the provenance area. Extraterrestrial processes creating the well-known Ries impact crater in the environs of Nördlingen during the Miocene have a minor share in the PGE budget by delivering molybdenum-ruthenium-osmium-iridium alloys and iridium solid-solution series (s.s.s.) minerals. Judging by the heavy mineral suites, Saxothuringian source rocks of the NE Bavarian Basement connected with the Donau River via the Naab River drainage system have not contributed to the element budget of the “Donauplatin” under study. Stream sediments which have been derived from this provenance area are characterized by low-temperature (LT) crystalline rocks and a considerable proportion of pegmatitic and metabauxitic material lacking in the Holocene sediments of the “Donauplatin”. We are indebted to I. Bitz for her assistance during mineral separation and grain size analysis and D. Weck who performed the XRD analyses. All investigations were carried out in the laboratories of the Federal Institute for Geosciences and Natural Resources in Hannover, Germany. The final version of the paper was gone through by H. Millauer for linguistic editing. We express our thanks to N. Patyk-Kara and an anonymous referee who made some useful comments which were of assistance in the revision of the manuscript. We also extend our gratitude to J.G. Raith and G. Garuti for their editorial handling of our manuscript and for some additional remarks to improve a preliminary draft of our paper.